US Senator Edward J. Markey. Radioactive isotopes were making their way into the country’s milk supply, and Edward J. Markey, the son of a milkman, was sounding the alarm. He delivered his appeal to the biggest audience he could find: students, parents, and staff gathered for the Malden Catholic High School science fair. The year was 1962. Markey was 15. Twenty years later, he was a congressman calling for a freeze of nuclear weapons before almost a million protesters in Central Park. “This is just the beginning,” he pledged. Now, more than three decades after that, Markey is still warning of our shared nuclear peril — only this time from his perch in the US Senate. No elected official on the national scene has been banging the drum about the nuclear menace as loudly and for as long as the 71-year-old Malden Democrat. And with President Trump’s nuclear saber rattling and fervent embrace of a new arms race, Markey’s decades-long efforts have again gained relevance. In January, the president called for plowing money into nuclear weapon modernization to make the arsenal “so strong and powerful” it would deter any acts of aggression. Markey expressed dismay at the push, saying it would increase the risk of nuclear war. 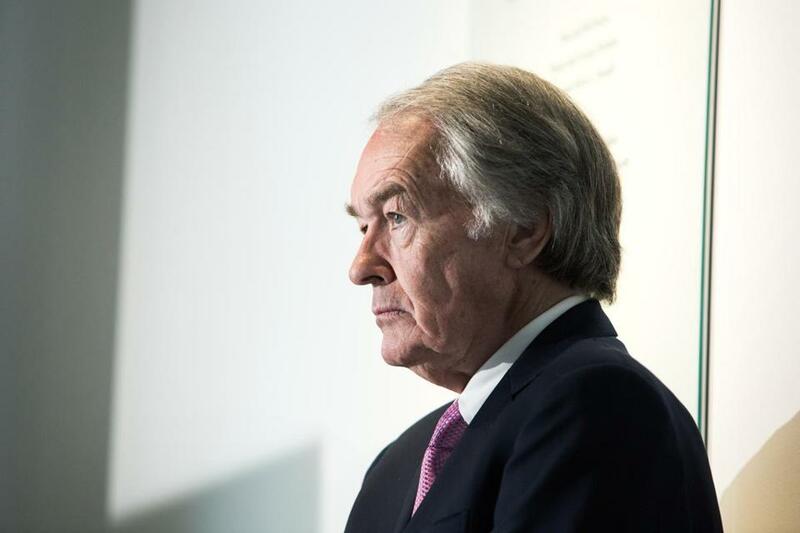 Through his 41-year career in Washington as a congressman and a senator, Markey has seen the nation’s fear of thermonuclear annihilation, and attention to efforts to limit the menace, ebb and flow. All the while, he’s made the case that the proliferation of nuclear power is directly tied to the proliferation of nuclear weapons. In the 1970s, Markey toured the Pilgrim nuclear power station in Plymouth and the still-being-built reactor in Seabrook, N.H., with concern. In 1979, he fought a public but unsuccessful battle for a half-year ban on the construction of new nuclear reactors. After the Soviet Union’s collapse, he pressed for greater oversight of power plants — including those in Massachusetts and New Hampshire — by the Nuclear Regulatory Commission. He expressed worry about the development of “mini nukes” in the years after the 9/11 terrorist attacks. And, even as he’s passed laws on everything from telecommunications to the environment to the opioid crisis, fighting nuclear catastrophe has remained his lodestar. In the Globe interview, Markey underscored his long-held belief that no country can win a nuclear war, because such a fight will have no victor. He pointed to an errant inbound ballistic missile alert blasted to people’s phones in Hawaii last month as evidence. After the message went out, there was much panic, but the vast majority of people did not have anywhere to go. Markey paused for a moment, his arms crossed across his chest. He left the thought unfinished.